With your roof there’s no such thing as too much protection. This is especially true with flat or very low slope roofing where water can pool up when there is a clogged drain. That standing water, especially on rainy Southern California days, will eventually find it’s way into a hole and thus into your building causing damage and allowing mold to grow. This is the principle in play behind our modified bitumen roofing systems. When one layer of protection isn’t enough – or even two for that matter – you can opt for the three-ply modified roofing system. This asphalt – based product is virtually impenetrable by water. Our modified roofing installation is popular for many reasons beyond being nearly absolutely leak proof. Some of our customers consider the membrane construction of modified roofing to be more aesthetically pleasing than the combination of asphalt and gravel as used in other built up roofing. This design also allows for various coating procedures which can help create a reflective ‘cool roof’ that improves your building’s energy efficiency. Modified roofing materials are essentially asphalt that has had modifiers added to it to create a rubbery or plastic feel. 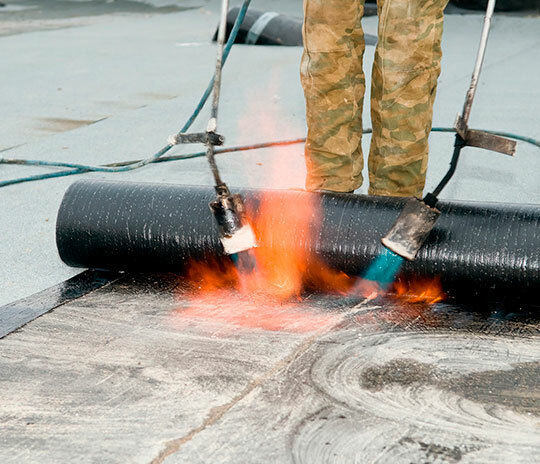 The modifiers help create a membrane that can be rolled onto a roof and sealed either with heat or by using a hot asphalt or cold-process adhesive. For added protection a second or even third membrane layer is applied on the flat or low slope roof. The type of modified roofing installed often depends on the type and condition of the substrate as well as the climate. Some of the modifiers used create a more flexible membrane while others are more durable against cracking, blistering, and oxidation that can occur when exposed to constant UV rays like we see here in Southern California. The types of modified roofing differ based mainly on which type of modifiers are added. For example, SBS (Styrene-Butadiene-Styrene) is applied with hot asphalt or a cold adhesive so that it maintains an enhanced rubbery feel. A base is nailed down and then the membranes followed by cap sheets. For this product a special coating is needed for protection against UV rays. Another type of modified roofing which may be more ideal for our Los Angeles climate is APP (Atactic Propylene). This membrane is applied with a heating torch where it adheres to the substrate and seals itself. The membrane becomes more durable – almost like plastic – and is able to better withstand UV rays and damage from weather.